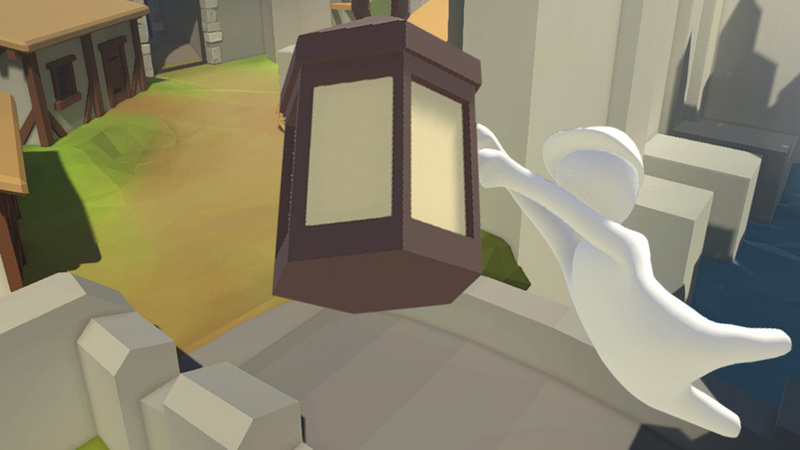 Human: Fall Flat is a playground puzzler that casts completely separate experiences depending on how and who you play it with. Venturing upon this journey all by yourself is a lonely ordeal, as you seem to be the only person alive within these desolate and almost featureless landscapes. However, add a friend into the mix, and that sense of isolation soon shifts into something much more hospitable, leading to consequences that are nothing short of hilarious. You play as Bob, a faceless human who stumbles around the place like a toddler who’s had his dummy dipped in brandy one too many times. The controls for Bob are simple but intentionally awkward, and somehow gives this blank canvas of a man personality. You waddle and jump around while stretching each arm individually with the shoulder buttons. This is aided by the angle that you tilt the camera to where you want your grabbing hands to aim towards. Once the controls are honed in to some degree, you soon start to lift environmental objects and props like a drunken man trying to pick a penny up off the floor. It’s within the ragdoll physics that truly bring out the charm and comedic value of Human: Fall Flat, especially when it comes to co-operative play. Falling off the edge of landscapes sees you toppling through the sky only for you to be dumped right back into the same environment with a lifeless thud. It doesn’t take long until you’ll attempt to lift your buddy off the ground as you decide to try and wrestling them off the edge in a spontaneous idle trick. Your companion’s inevitable retaliation will usually leave you both falling back to earth in the midst of the scrap, with one Bob face planting straight onto the other. Of course, there is the main objective to complete, but sabotaging your partner regardless of being a team effort is a trait in gaming that never seems to grow old. Speaking of objectives, there is really only one – trying to figure out how to get your clumsy character to each fire exit. You observe the land around you in order to seek what environmental tools are available to help meet your motive. Vehicles such as a wrecking ball crane or a dumpster full of coal that have been left abandoned can be operated in such a way that in the real world, Bob’s licence would almost certainly be revoked. Many of the props that surround you are usually there to help, although a lot of the stuff available isn’t necessarily required to your need. This sets each level up as a mini sandbox of sorts to doss around in as you please. Often I would find myself reflecting back to my juvenile self by persuading a mate to climb into a wheelie bin on top of a building, only to push him off just for the buzz of it. Your approach toward each obstacle is as open-ended as you want it to be. You can abide by the rules and pursue them as they are intended, or you can completely break the system by trying to exploit the mechanics with a bit of coordination and flair. It’s clear to see that the original sole creator, Tomas Sakalauskas wants the player to do what they want, however they want to do it. There are no rules as such to abide by, just the navigational boundaries to expand your imagination upon. Despite poor Bob being a blank mould in a human form, you do have the option to customise him to a certain extent. While the options seem to be a far cry from what’s available in the PC version, you can at least dress up your avatar to reflect that of Mario and Luigi if you desire. As far as any other extra features are concerned, there isn’t really any at all. There is no online multiplayer available, so don’t go in expecting to have your Discord chat at the ready with a group of mates looking for a laugh. Local co-op has a restriction of just two players also, however a recent update at least allows you to give a Joy-Con to a friend for convenience. But be warned, despite the efforts of using the motion control to navigate the camera, the camera itself can be very temperamental at times. It’s not impossible to use by any means but may prove to be frustratingly challenging for some. Despite the fair share of bugs that I ran into in Human: Fall Flat, I couldn’t help but feel that they play a part in the overall novelty. Sure, items can fall through the floors, while both important contraptions and Bob can get hopelessly stuck – temporarily breaking the game in the process. But it’s moments like these that can be undeniably funny. The biggest issue I found was with the camera. It can be horrendous at times and really could do with being improved, especially because of how much you rely on it to control Bob’s arms. It would also be great to see new features added in the future. Ideas of so many modes that could be put in place become obvious the more that you play Human: Fall Flat. I would love to see some sort of versus time attack mode that pits multiple Bobs racing to complete a stage, along with the joy of disrupting each other’s progression in the process. Visually it manages to stay very basic, but bold and attractive at the same time. The biggest surprise, however, was the music. Stretches of silence are broken with epic cinematic-style orchestral tones which tend to unintentionally play out in fitting moments such as trying to save a mate from falling off a cliff. While such a soundtrack seems an odd match to the flavour of the game, it all just seems to fit seamlessly like a glove. Human: Fall Flat is a fun-filled experience that is best played with others. While you can pursue the journey of builder Bob alone, there’s just no comparison in sharing such an adventure with a friend. Think Snipperclips and Gang Beasts stirred in an alcoholic punch before trying your hand at parkour. This may give you an idea of the clumsy capers that await in this side-splitting unconventional little title.